A Japanese bee has been bred in various places from old days. There seems to be a device that the feeding procedure is various. I want also to try and err while devising it. A Japanese bee There are various kinds of bee's houses. Generally, coming with a bee's house of boxes type seems to be more abundant. Moreover, there is coming by using the hanging type and the horizontal trunk type, too. The installation location of the bee's house is generally said that the place where sunshiny that the east or the south with a little traffic opened is good. Because direct sunshine is interrupted in summer, and you should exist warm sunlight in winter,Under the deciduous broad-leaved tree is good. The bee's house is put on the stand such as concrete blocks without grounding it directly to prevent moisture. To prevent the repercussion from the ground of rain, it makes it to the height of about 20-30cm or more. The wave board etc. 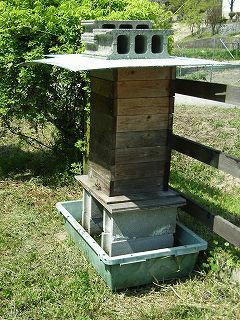 of the galvanized iron, the vinyl chloride, are put to avoid rain on the bee's house, and the block and the stone are put up so that it doesn't fly because of the wind. It is a breeding box for my Japanese bee. It is a breeding box of a Japanese bee that captures by me and is breeding (nest of boxes type). The put place is on a big rock in Sugibayashi that sunshiny is good. This breeding box is about 180mm, the board thickness 12mm(externals about 260mm corner and 1 step) in height, and whats piled up in four steps. The stand below piles up 10cm block by two steps. Bee's doorway has been installed in the the lower. Rain is prevented from hanging in the upper part in the iron plate. Moreover, the block is put so that it doesn't fly the iron plate because of the wind. 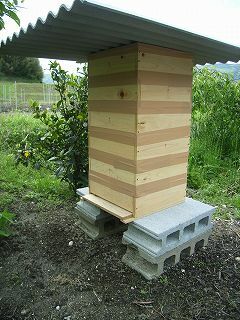 The bee's house of four steps connects the top and bottom with the board on a horizontal side. It can always be a separation because it stops it with the wood screw if it is thought that it removes. The entire breeding box is bound with the wire that passes the hole under the block. The purpose of this is to prevent the entire box from falling because of the wind etc. The inspect privately it is possible to clean it at any time with the nether plinth because it doesn't connect it. Afterwards, the bottom plate was remodeled to the slide type. When there is a nest and the hand besides the box on is put, I feel the heat of the nest though this bee's house was made from the board thickness 12mm. Heat corresponds and seems to leak. Board thickness should be increased a little more. The bee's house is scheduled to be made from the board thickness of 19mm or more in the future. It is a photograph in the breeding box of a Japanese bee in Mr. T house in the Kurashiki City Mabi-cho. In this box, the height of one step was eight steps every about 90-100mm in externals about 300X350mm corner. Board thickness was about 30mm. The box was put most below and water of the bee's house was put. The role of this water was a thing that the ant must not invade the bee's house. This is a good idea. The place where the bee's house is put is done in the peach and the orchard of the pear. The panel of the vinyl chloride put up interrupts direct sunshine to some degree though it gets much sunlight. 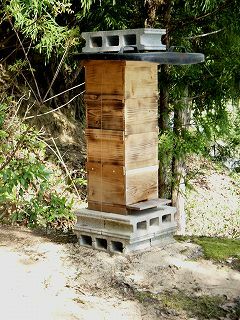 This photograph is a bee's house of the person who started the apiculture of a Japanese bee recently near my home. Then, the bee's house of the slide type bottom board was discovered. The plywood board of the bottom can be detached by doing the slide forward. The cleaning is very easy. The inside can be seen from the bottom with hand glass, and it take a picture with the digital camera. Externals size of the bee's house was about 325 mm square. Board thickness was about 14mm. Height was about 120mm a step. It was sealed up to the joint in interilevel with the packing tape. The roof was a corrugated plate of the slate.